A final speech (from which the above lines are excerpted), delivered from the scaffold, was all that King Charles I left his subjects when he was executed on January 30, 1649. Charles I’s reign marked a difficult time for the Kingdoms of England, Scotland, and Ireland, characterized as it was by a royal court prone to deceit and legal circumvention, and culminating with the devastation of the English Civil War. Despite his last words praising the law, during his tenure, Charles belittled, bypassed, and even dissolved his Parliament. The Louis Nye collection at Brandeis University, comprising over 120 17th-century books and pamphlets, offers a variety of views and perspectives on the events that unraveled over the course of King Charles I’s rule. In addition to providing detailed insight into this period, the Nye collection includes varied works exploring the reigns of prior monarchs (including a history of Queen Elizabeth I), and the world beyond England (including documentation of exhibitions beyond Western and Central Europe). Highlights from the collection—which was generously donated by Louis Nye—are described below. Several pieces in the Nye collection provide an in-depth explanation of what led to King Charles I’s execution. Manipulation was Charles’s weapon of choice in his campaign to gain power. Cyprianus Anglicus details the life of William Laud, Archbishop of Canterbury, and tells of Laud’s work with King Charles to change the oath of the king, rendering the monarchy more beneficial to the king and less to the common people. 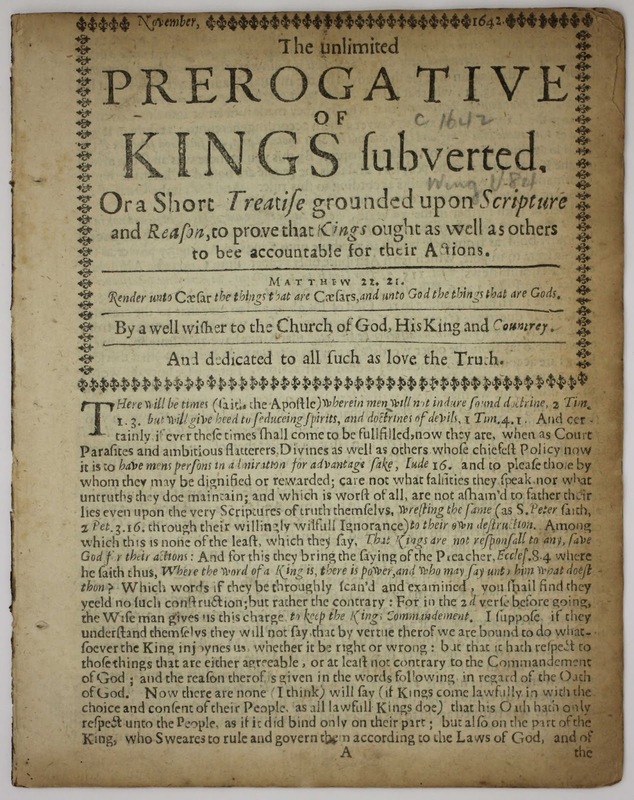 A complement to Cyprianus Anglicusis a pamphlet entitled The Unlimited Prerogative of Kings Subverted. 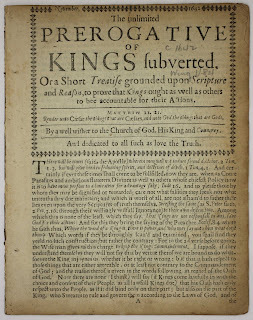 This pamphlet expresses the belief that “Court Parasites” and “ambitious flatterers” should not have the authority to pressure the king or impact his decisions. It also describes Charles’s philosophy of the divine right of kings, in which kings can make decisions without the people’s input. However, the pamphlet clarifies that a king and his subjects create an agreement in which subjects will follow their king unquestioningly, and the king will do right by his subjects. Unfortunately, by not advocating for his people and refusing to work with Parliament, Charles did not uphold this oath – a fact of which he was keenly aware. England’s Black Tribunal describes how, prior to his death, Charles wrote to his son—later King Charles II—describing his failure to uphold his promise to his subjects. In this letter, Charles explained that he had not been the best of kings; though he does not actually account for his wrongdoings, Charles does confess to working against his subjects’ best interests and enlightens his son on how to be a better ruler than he ever was. In addition to many accounts of King Charles I, his accomplices and enemies, the Nye collection includes a detailed history of the childhood and reign of Queen Elizabeth I. Annales: The True and Royall History of the Famous Empresse Elizabeth, was written by William Camden and published just twenty-two years after Elizabeth’s death. This book summarizes Elizabeth I’s genealogy, the six wives of King Henry VIII, and the difficulties that each created. In order to wed Anne Boleyn, Henry VIII claimed “that [his] marriage [to] Katherine [of Aragon], who before had been wife to his brother…was forbidden by the Divine Law” (C3). The history continues with Elizabeth’s birth and Anne Boleyn’s beheading. After Queen Mary’s death, Elizabeth ascended the throne and was offered to her sister’s widower, with the “promise to obtaine a special dispensation from the Pope” (B2). However, Elizabeth believed that King Philip II of Spain only wanted control of England. Among Elizabeth’s many marriage proposals and their subsequent rejections outlined in Annales, there is a curious absence of any mention of Robert Dudley, Elizabeth’s good friend and the rumored favorite for her hand. But perhaps the most glorious part of this work is the frontispiece portrait of Queen Elizabeth in which she is portrayed surrounded by clouds and the words, “Per Tal Variar Son Qui.” The exact origin and meaning of this phrase is unclear but it appears to refer to those change the world, an appropriate motto for Queen Elizabeth’s life and works. For Elizabeth was not a typical queen, but one who led her people with pride and honor, changing the English throne, and the world, forever. The Voyages and Travells of the Ambassadors Sent by Frederick Duke of Holstein, to the great Duke of Muscovy, and the King of Persia (translated from the original Dutch by John Davies) describes those people and cultures that the titular ambassadors encountered abroad. The most fascinating parts of this anthropological narrative are the meticulously drawn maps. Each diagram is extremely fragile, but impressively depicts the places that were traversed. A new map of Muscovy is included in the illustrations, not only portraying the entire Duchy, but also present-day Finland, Ukraine, Iran, and Turkey. This map clearly illustrates different regions, cities, and bodies of water, producing a remarkable map of Central Eurasia, centered on present-day Moscow. Following the progression of the ambassadors’ journey, one of the next diagrams illustrates the Vulga River, which took these travelers from Moscow to the Caspian Sea. Ultimately, the Caspian Sea brought these voyagers to the Persian Empire. The map of Persia in The Voyages and Travells portrays the empire’s extent under the Safavid Dynasty and most of the present-day Middle East. It is extraordinary to look at these impressive 17th-century diagrams alongside modern maps and witness the travels of these ambassadors and the remarkable precision of the mapmakers. The Louis Nye collection at Brandeis University offers a unique perspective of 17th century England. Most of the works center on King Charles I, Parliament, and the English Civil War. These texts illuminate the events and issues of King Charles I’s time, showing him not only as the manipulative ruler he is known to be but also as a man who recognized his own failings as a leader. Ultimately, the Nye collection allows its readers to understand the past from the varied perspectives that it offers. Description by Lee Wilson, undergraduate student in International & Global Studies and Archives & Special Collections volunteer. Find out more about the Louis Nye collection on the Brandeis Library Catalog. A large part of the Louis Nye collection is digitized and freely available on the Internet Archive.